Can I purchase more than 12 months of software maintenance? 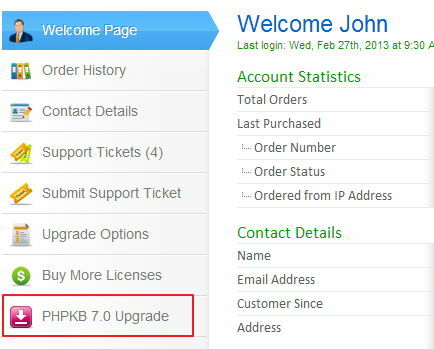 This information is for all PHPKB customers those would like to upgrade from PHPKB 6.0.x to PHPKB 7.0. We are pleased to announce that we have rolled out the PHPKB 7 upgrade in the customer area of our website and you can download it depending upon your eligibility. You may wish to take a look at PHPKB 7 Release Notes to see what is new in the latest version. Please follow the instructions below on how to download the free upgrade. If you have purchased any PHPKB 6.0.x software license in last 12 months. If you have purchased an active support and software maintenance subscription. If you satisfy any of the above mentioned conditions, you are eligible to get free upgrade to version 7 from the customer area of our website. Please login to the customer area with your account details and click on the "PHPKB 7.0 Upgrade" link in the left menu as shown in the image below. If you do not see the link to download free upgrade or if you see the message shown below, it means that you are not eligible to get free upgrade to PHPKB 7 and you need to buy the upgrade. You are not eligible to download free upgrade to PHPKB 7 because you do not have an active support and software maintenance subscription. However you can purchase the upgrade to PHPKB 7 from "Upgrade Options" link on the left side. You will get 20% discount on normal price being an existing customer. Once you have downloaded the upgrade package, your download status will be marked as "Yes" and the download link will be removed from your customer area. Please refer to the upgrade instructions below on how to perform the upgrade. The free upgrade package of PHPKB 7.0 comes with its default layout and features. It is strongly advised not to perform the upgrade if your existing PHPKB 6.0.x package has been customized or modified in any way. 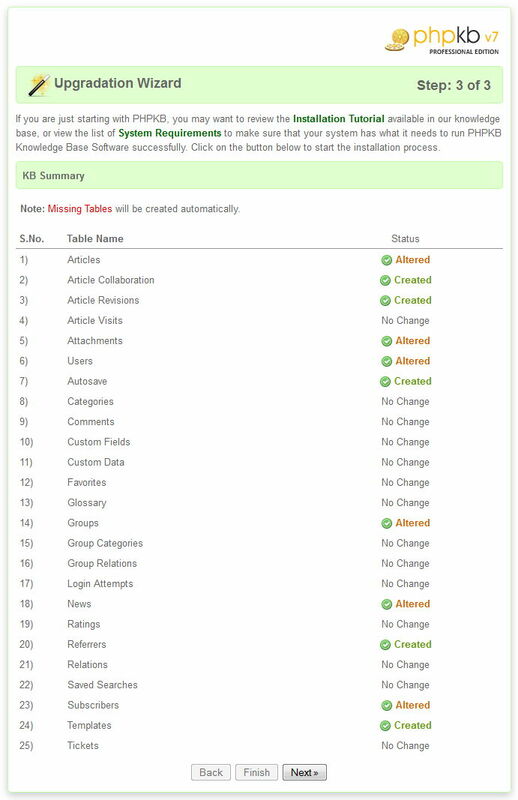 You will lose all customizations done in your existing knowledge base if you perform the upgrade. We shall not be responsible for loss of any kind. Please proceed only if your PHPKB 6.0.x package has not been modified in any way and its data structure has not been altered from its default structure. If your PHPKB 6.0.x package has been customized and/or modified, you may wish to contact us to get the same customizations and/or modifications done in version 7 for you as a paid job. We charge $35 per hour for such jobs. What happens during upgrade process? 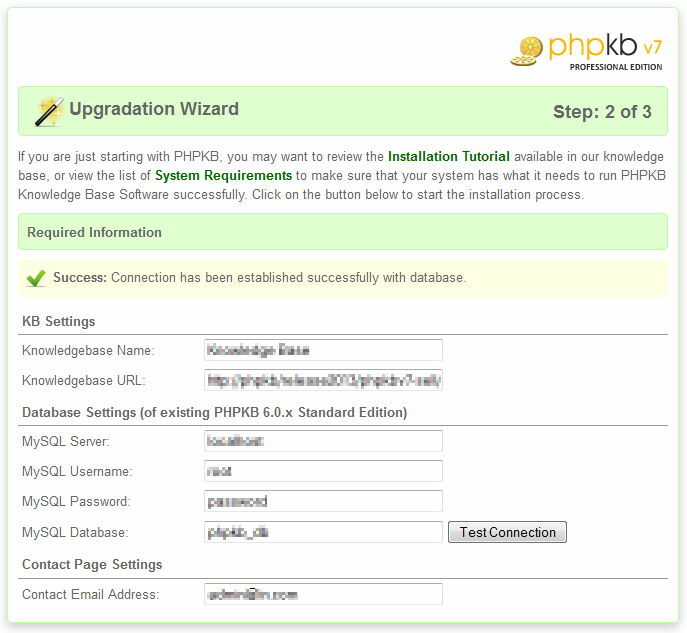 The upgrade process makes changes to the database structure of PHPKB 6.0.x editions to make it compatible for PHPKB 7.0. Changes made to the DB structure cannot be undone. It means that you will not be able to use PHPKB 6.0.x once its database structure has been altered for compatibility with PHPKB 7.0. For the purpose of explaining upgrade steps, we assume that your existing site URL/hostname is "yourdomain.dom" and the existing knowledge base folder name is "phpkbv6". So, please replace "phpkbv6" with your knowledge base folder name while following the steps below. Taking Backup - It is strongly advised to take full backup of your existing knowledge base folder and its database. To back up the knowledge base data, please login to the admin control panel of your PHPKB 6.0.x knowledge base as a Superuser. Once you are logged in, click on "Tools" section, then "KB Backup" sub-section and then "Full Backup" option as shown in the image below. This will prompt you to save the backup as "SQL" file or as a "Compressed" file in zip format. 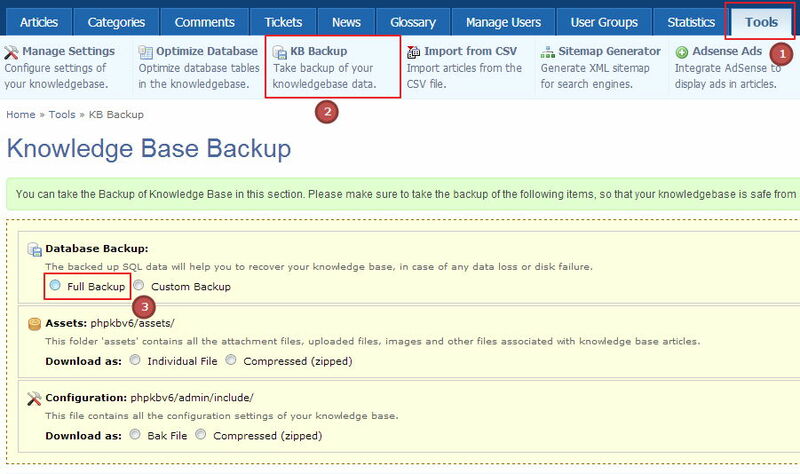 You may also wish to read our knowledge base article on how to take backup of your knowledge base data for more detailed instructions. Unzip Upgrade Package - Now, please unzip the contents of upgrade package downloaded from the customer area. You will see a folder called "phpkbv7". Copy Important Files - Please copy the following items from "phpkbv6" folder to "phpkbv7" folder. system.php from "phpkbv6/admin/include/" folder to "phpkbv7/admin/include/" folder. All files from "phpkbv6/assets/" folder to "phpkbv7/assets/" folder. If you are using the multi-language edition of PHPKB 6.0.x then copy all languages files except en.php from "phpkbv6/admin/languages/" folder to "phpkbv7/admin/languages/" folder. Starting Installation - It is now the time to start the upgrade process. Open your browser and go to the address http://www.yourdomain.com/phpkbv7/ where 'yourdomain.com' is your website address and 'phpkbv7' is the name of upgrade package folder to which you've uploaded the files. Installation wizard will start automatically. 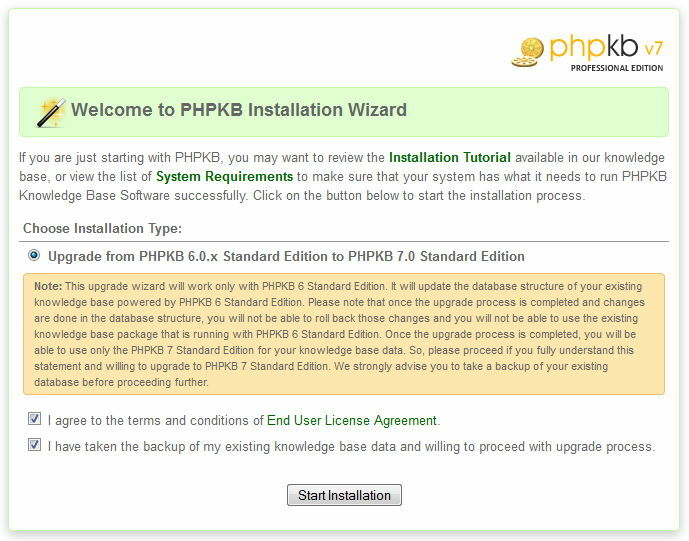 Select the "Upgrade from PHPKB 6.0.x to PHPKB 7.0" option, read the NOTE carefully and click on "Start Installation" button as shown in the image below. On the next page i.e. 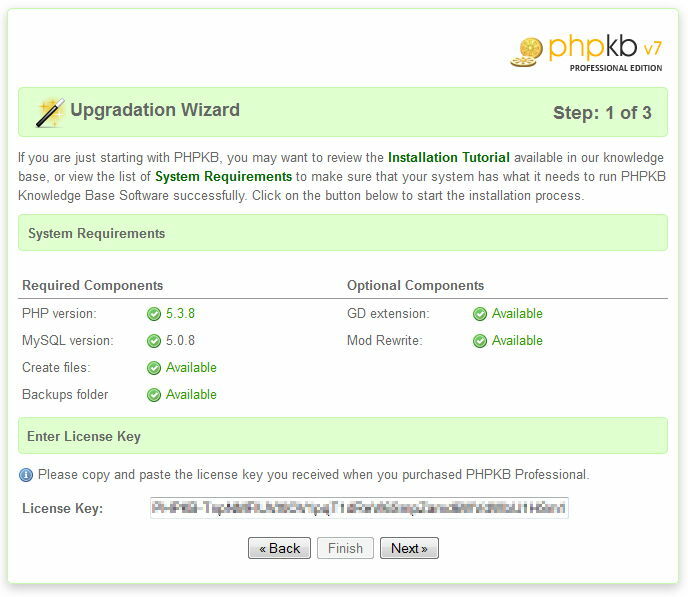 Step 1 of Upgrade Wizard; please enter your PHPKB 6.0.x license key that you received when you purchased the software as shown in the screenshot below. It is important to note that if you have purchased any type of upgrade from us in recent past such as "Upgrade Admin Users" or "Purchased Support Renewal" then you should have received an "Upgrade License Key" from us. If you have an upgrade license key then please enter that key instead of the one that was received when you first ordered the software. On the next step, you are prompted to give a name to your new knowledge base. The URL is detected automatically by the upgrade script. Then you are asked for the database connection details of your PHPKB 6.0.x knowledge base database. Please click on "Test Connection" button to verify that specified database connection details are correct. In last field, you are asked for an email address that will receive all support tickets submitted from "Ask a Question" form of the knowledge base. Click on "Next" button as shown in the image below to start the upgrade process and make changes to the database structure of your existing knowledge base. This step displays the summary of operations performed on the various database tables as shown below. Click on the next button. This step finishes the upgrade wizard, creates the configuration file and gives you the URL to login to the admin console of PHPKB 7.0 as shown in the image below. You can now login to the admin area of PHPKB 7.0 to see if everything works as expected. Once you are satisfied with the working of PHPKB 7.0, you can discard your previous "phpkbv6" folder. If you have any questions and/or doubts, please feel free to submit them as a new support ticket from the customer area.